is just as colourful and beautiful as the much better-known Indian national bird, the Indian Peafowl. But alas, being a crepuscular (active at dawn or dusk) bird, and a migrant to our State, it’s not easy to spot this bird at all. All we usually go by is quick, short sightings, as we see it turning over the leaf-litter in some leafy glade, generally in light so bad that photography is near-impossible. 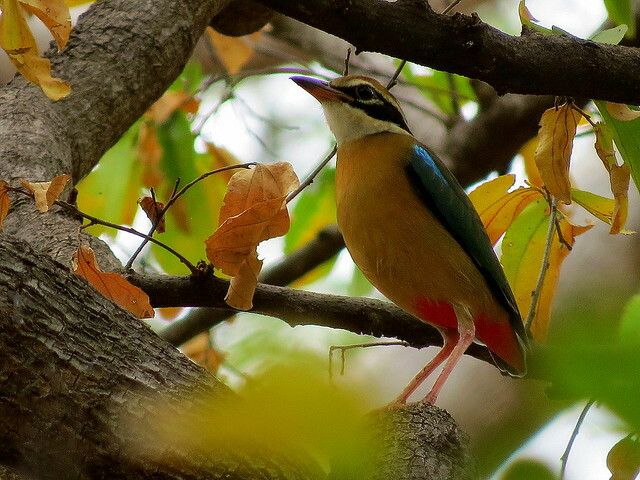 When I visited the Cauvery Wild Life Sanctuary (CWLS) on the banks of the Kaveri, recently, we were overjoyed to see one bird hopping around in the undergrowth. As usual, it managed to keep out of sight behind bushes and in the dips in the ground.The small stubby-tailed bird is mostly seen on the floor of forests or under dense undergrowth, foraging on insects in leaf litter. It then hopped on to a tree, which is when we were able to get some shots. 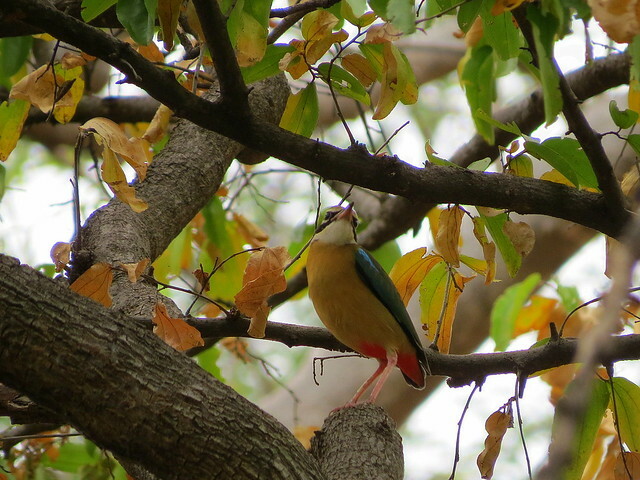 Indian pittas roost in trees. Thy feed on insects and other small invertebrates that they usually pick up from the ground or leaf litter. They have also been noted to take kitchen food scraps from the ground. They breed during the south-west monsoon from June to August, with peaks in June in central India, and in July in northern India. The nest is a globular structure with a circular opening on one side built on the ground or on low branches. It is made up of dry leaves and grasses. The clutch is four to five eggs which are very glossy white and spherical with spots and speckles of deep maroon or purple. The eggs must be very beautiful, but I’ve never seen a nest or an egg. The wiki entry says, “It has long, strong legs, a very short tail and stout bill, with a buff coloured crown stripe, black coronal stripes, a thick black eye stripe and white throat and neck. 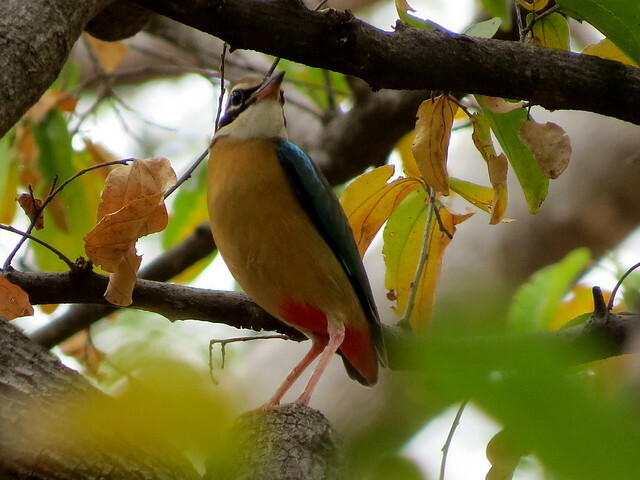 The upperparts are green, with a blue tail, the underparts buff, with bright red on the lower belly and vent.” What a scientific description of a rainbow bird! It is more often heard than seen and has a distinctive loud two-note whistle wheeet-tieu or wieet-pyou or sometimes, a triple note hh-wit-wiyu. 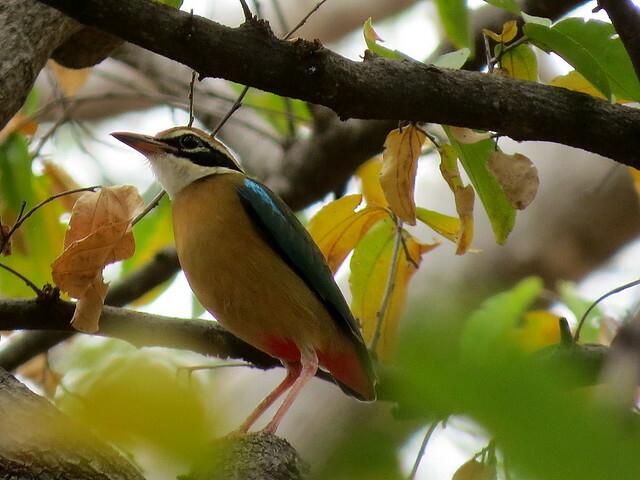 They have a habit of calling once or twice, often with neighbouring individuals joining in, at dawn or dusk leading to their common name of “Six-O-Clock” bird in Tamil. When calling the head is thrown back and the bill is pointed upwards. I remember,at Nandi Hills, hearing two of them constantly calling to one another and except for brief flashes, remaining out of sight! 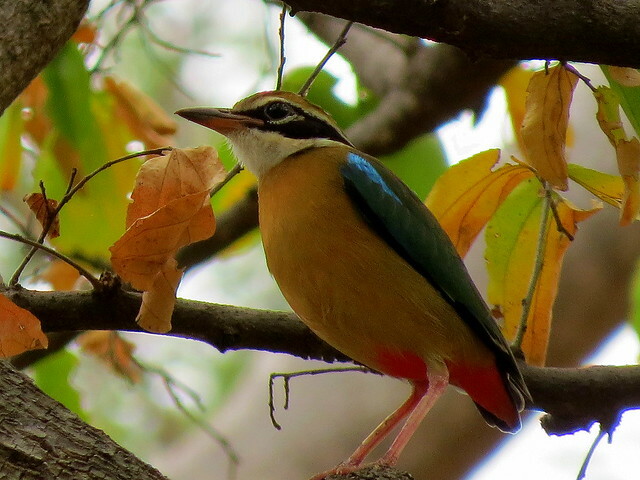 ndian pittas breed mainly in the Himalayan foothills from the Margalla hills northern Pakistan in the west, to at least Nepal and possibly up to Sikkim in the east. They also breed in the hills of central India and in the Western Ghats south to Karnataka. They migrate to all parts of peninsular India and Sri Lanka in winter. Exhausted birds may turn up inside homes. They are rare in the drier regions of India. 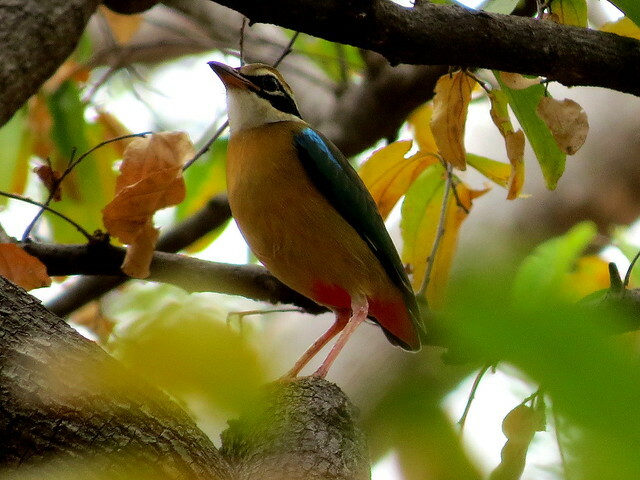 Yes…one exhausted bird turned up last year at the doorstep of my friend Abhilash Pavuluri! What a find! 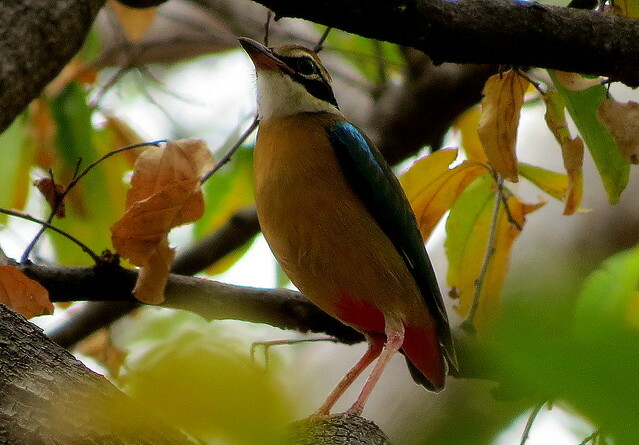 The Pitta…a bird which avid birders look forward to sighting, every winter!